I recently moved a huge DIY twig sculpture from our Dining Room area to a wall space in our Entry Foyer. I keep repeating myself, but I’m looking to lighten and brighten our home. As much as I loved my twig sculpture, I wanted something new, fresh and lighter feeling. 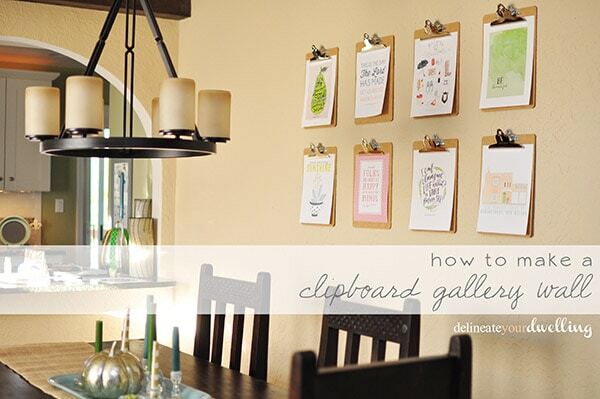 Today I am sharing my new Clipboard Gallery Wall. I knew I wanted to incorporate a gallery wall in my home and this seemed like the best location. But, how would I ever be able to narrow down the prints I would use? 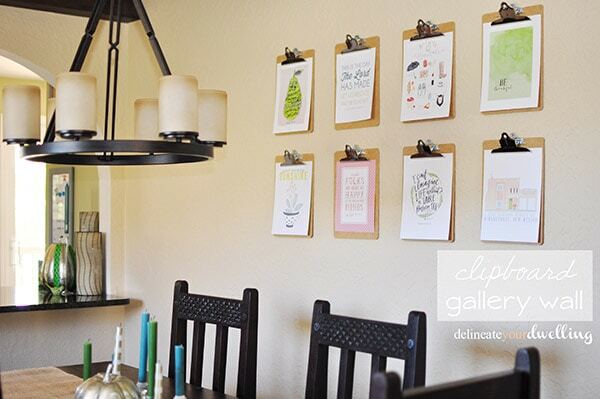 Introduce the clipboard gallery wall! Using a clipboard, I could rotate prints and pictures in and out whenever my little heart so desired. I was smitten with the idea. I loaded up the kiddo’s and headed to Office Max to buy eight plain clipboards. 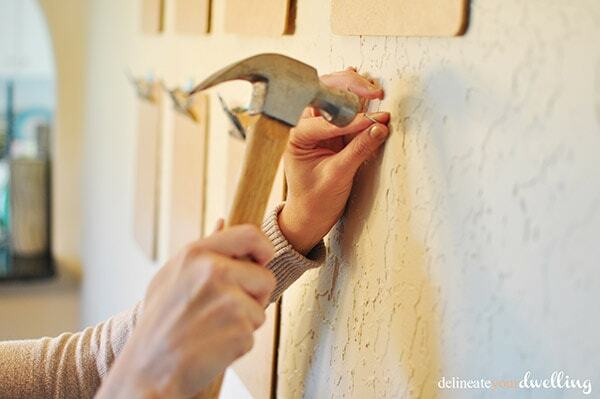 At a little under $2 a piece, this was a great inexpensive DIY project. First, I laid out my basic pattern on the wall with pieces of paper (yes, kiddo #2 did a little coloring on one). 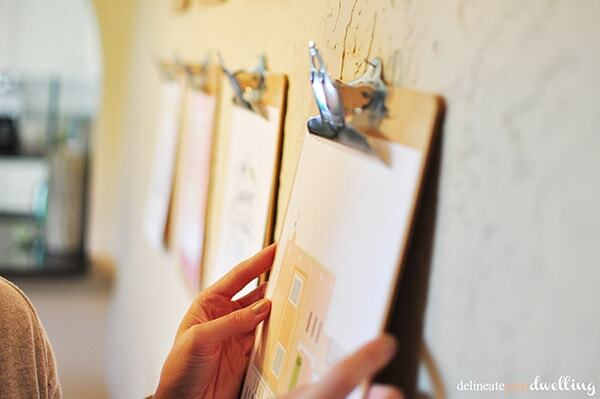 Using a level and a measuring tape, slowly the clipboards made their way onto the wall. I was so thrilled to see these eight blank canvas’ waiting to be filled up with prints. I had printed a few of my own designs at Kinkos and then ordered a few additional ones from my favorite Etsy stores. I was like a kid in a candy store as my Etsy prints slowly made their way to my mailbox and then to my wall. Snail mail at it’s finest. Ah, finally! They all arrived and I was as happy as a lark. A wonderful mix of inspirational quotes, hide them in your heart bible verses and fun graphics. 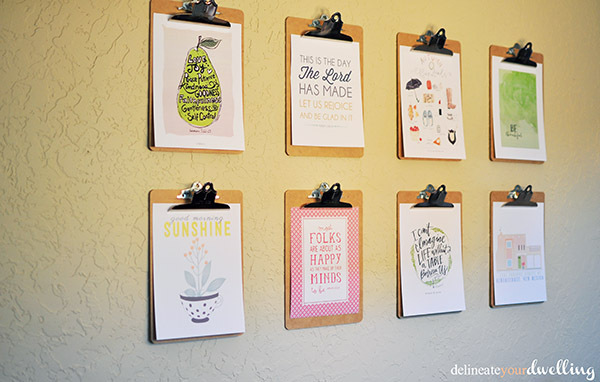 I already am thinking I need a few more clipboards… too many great prints out there! 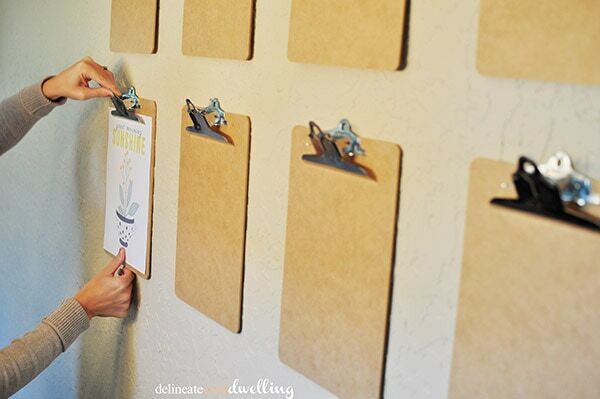 How many clipboards do you think would fit your space? This is so cute! I love the way this turned out! Thanks for the idea! I love that you can switch out the pieces of art at any time. It can change along with the seasons–I love it! I’m glad you linked this up to Frugal Crafty Home Blog Hop–I love seeing your creative projects at our party! Thanks for the love, Carrie! I’m excited to see it transform for each season, too. And I always love stopping by your parties… they are the best! Thank you for the feature, Mandy!! Such a cute idea! 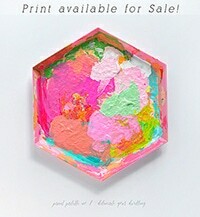 Love the look and it would be great for even displaying the children’s art! Thanks for sharing!! Super cute idea! Would be great for displaying children’s art! Looks great! Thanks for stopping by, Krista! Such a neat idea! I love how this turned out!! You will be featured this week on Tell Me Tuesday! As always, thank you so much for the feature! Great idea! I have some large empty walls and I think this would be perfect! Thanks so much for sharing! Thanks for the invite, Erin. I stopped by and linked up! 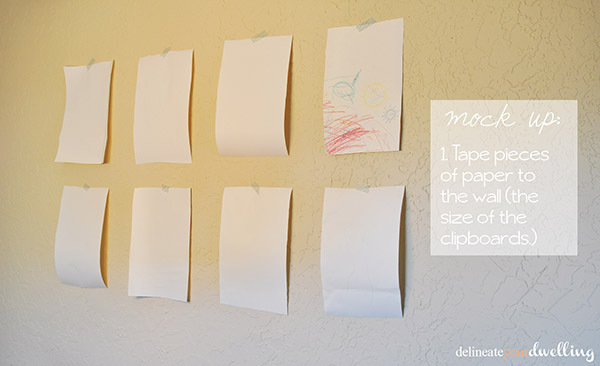 I love this idea, also a great way to display children’s art work in a hallway. I also love quotes, so I see this as an inspirational wall a place to go for scripture or a much needed good thought. Thanks for sharing on Tuesdays With a Twist please come by tomorrow and share again. Thanks Joyce. I’m really excited to see where these clipboards go each season. Sometimes filled with kid’s art, sometimes scripture, sometimes just beautiful prints! This is a great idea! I love your variety of things you put on your boards. Thanks, Emily. I’ve got so many wonderful prints, it’s going to be hard to decide which ones to hang! This is exactly the idea I have been looking for: thanks! Thanks, glad to be a help! Thanks for stopping by. Just think – when you add new prints, you can leave the old one clipped underneath it. 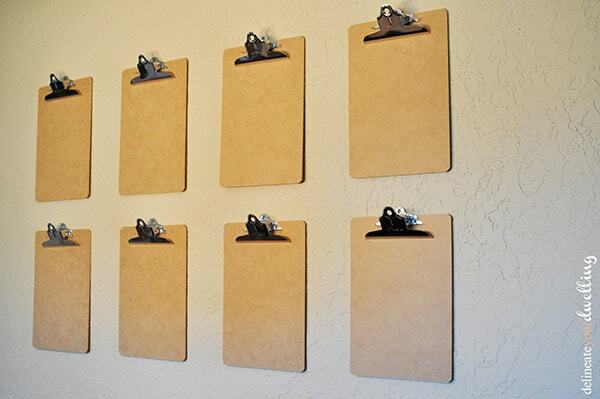 I love the look of just the line of bare clipboards. Oh, I like the idea of layering the prints. Thanks for sharing! How lovely! I love this idea, I’m always on the look out for new ways to display my daughter’s art. Thanks for sharing this cute idea. Visiting from Gingerly made, show & tell. 🙂 Great post. Great Idea! You see so many great quotes out there that fit your mood, family, or home! But who wants to commit to just one…I know I can’t! I’m pinning this one to our board! Thanks for sharing on DIY Sunday Showcase! I think my favorite thing about this is that you can switch it up whenever you want! love that. Thanks for sharing. Visiting via Winthrop chronicles link up. 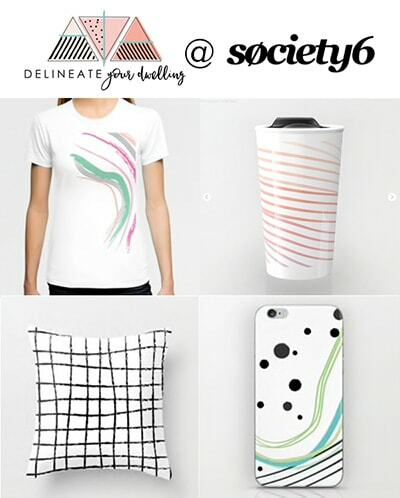 Such a fun and creative way to show off art, prints, you name it! Love this idea. I love this! Thanks for linking-up at the Get Inspired Weekend Pinning Party! Coming over from the link at TT&J. Looks great! I did this in our office over the summer and just love. I’m actually adding another row right now (well, I’m short two because I can’t find more clipboards)….but the more the merrier, right? I hear ya, Ashley! I’d do my entire dining room and living room in clipboards if my hubs didn’t hold me back, ha. I have been wanting to do something with clipboards for a while. I love being able to switch out artwork or the kids’ drawings. You made it look so great! Thanks, Anne! I had wanted the ability to swap things out forever and FINALLY just bit the bullet and went the clipboard route. Totally worth it! This is such a great idea! I was just looking at the pictures of your home, and it is so beautiful! I love the beams and all the architectural detail! Thanks, Alexis. I’ve done my best to embrace the SW stucco style, but not being tooo southwest. Super cute! I love clipboards on the wall. Yours are great! i’ll never stop repeating this – you are a freakin’ genius! Ha, you make me laugh. Thanks. It’s kind of unconventional, but I love it!